At least 11 people were killed after gunmen stormed an education department compound in eastern Afghanistan Wednesday, officials said, sparking an hours-long battle with security forces in the latest attack in the restive region. Ten others, mostly employees, were wounded in the second attack in Jalalabad city in as many days, Nangarhar provincial governor spokesman Attaullah Khogyani said in a statement. Many of the workers were trapped inside the building during the gun battle between security forces and militants, which has ended. Twenty staff members were rescued. 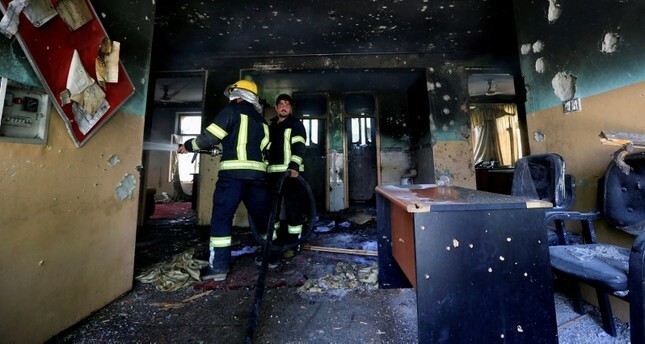 The 11 dead were all employees of the education department branch and included the director, Khogyani said. At least two attackers were involved in the raid and both were killed. The sound of gunfire followed by a "big explosion" that shattered windows alerted Qari Samiullah to the fact that an attack was under way near his shop. "I left my shop and ran when I heard a second explosion," Samiullah told AFP. "Smoke came out of the building and all the people started to run away. There was no immediate claim of responsibility for the raid. Local teachers had been delivering exam results from their schools to the office when the gunmen attacked, provincial education department spokesman Asif Shinwari told AFP. Jalalabad's education department was also attacked by gunmen exactly a month ago, wounding at least 10 people. Nangarhar's provincial capital has seen an uptick in violence in recent weeks, with the Daesh terrorist group claiming most of the attacks. On Tuesday, a suicide attack in the city killed at least 12 people and ignited a nearby petrol station, with witnesses describing screaming victims "swallowed" by flames. The bomber was targeting Afghan security forces when he blew himself up. Ten civilians were among the dead. Daesh claimed that attack via its Amaq propaganda agency. The series of high-casualty suicide bomb attacks in the province comes as U.S. and Afghan forces continue offensive operations against the group. One of the deadliest was on July 1 when a suicide bomber blew himself up among a group of Afghan Sikhs and Hindus in Jalalabad, killing at least 19 people. While the Taliban is Afghanistan's largest militant group, Daesh has a relatively small but potent presence, mainly in the north and east of the country. Wednesday's attack comes a day after President Ashraf Ghani flew to Brussels to attend a NATO summit where he will be hoping to get a greater commitment from members to the nearly 17-year conflict. British Prime Minister Theresa May is expected to pledge to send 440 extra troops to Afghanistan during the summit. A recent ceasefire between Afghan security forces and the Taliban during the Islamic holiday Eid had raised hopes that an end to hostilities in the war-weary country was possible. Since then, however, the Taliban has returned to the battlefield and Daesh, which was not involved in the truce, has continued to carry out deadly attacks. Nangarhar borders Pakistan, which has been under growing U.S. pressure to crack down on terrorist groups operating in the country. Pakistan has long been accused of supporting the Afghan Taliban and providing safe haven to its leaders, charges Islamabad denies. Pakistan, in return, has accused Afghanistan of sheltering the Pakistani Taliban.